The Metro U-Pass is a reduced-fare transit pass, offering students unlimited rides to campus, work, shopping, or anywhere they choose on any of Metro's bus or rail lines. Metro U-Pass is valid from December 31, 2018 - to June 2, 2019! The Metro U-Pass are offered to students at a subsidy price of $95 for Spring 2019. The U-Pass subsidy funding comes from Associated Students and Parking and Transportation. CSUN undergraduate students enrolled in 6 or more units, or graduate students enrolled in 3 or more units are eligible to purchase a Metro U-Pass. You must have a CSUN student ID card. Online: The Metro U-Pass can be purchased/renewed directly through the myNorthridge student portal under the Financial Matters tab. In Person: The Metro U-Pass can be purchased/renewed at the AS Ticket Office located in the University Student Union. AS Ticket Office hours are 10am to 6pm, Monday through Saturday. To help expedite boardings along the Rapid 744 bus line, Metro has installed two TAP validators at the CSUN Transit Station. Tap your card on the TAP dial. Wait for the “beep” sound and “GO” message. If you are paying with cash, you must board through the front door. 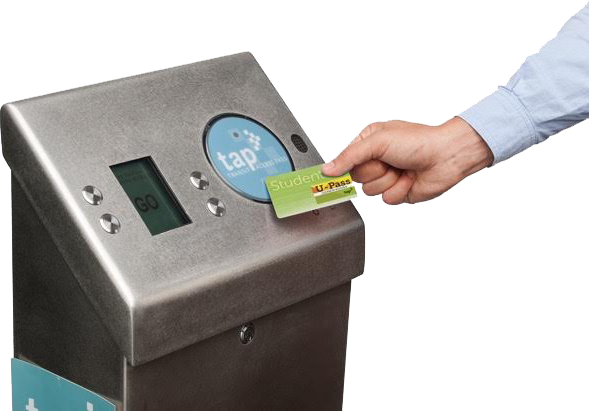 Important: Only tap a validator if you are riding the Metro Rapid 744 bus line at CSUN transit station. For all other lines, tap onboard at fareboxes. Metro U-Passes are valid on any Metro bus or rail line, but cannot be used to ride the buses or trains of any other transit agency (Metrolink, LADOT, DASH). Effective March 1st, CSUN students will be able to use the U-Pass on the Big Blue Bus (BBB). If a rider uses two or more transit agencies, the Metro EZ monthly transit pass may be a better option. See the AS Ticket Office for more information about the Metro EZ Pass. Commuting for the first time? You will get useful tips on how to plan your trip, buy a pass and ride the Metro bus system at Metro's website.